Climate change is providing unprecedented access to an abundance of minerals buried under Nunavut’s Arctic ice causing a new cold rush for the province’s mineral wealth. As environmental warming melts long frozen ice in Nunavut, the front line of climate change is facing a new “cold” rush, a dash for the North’s untapped mineral resources. Nunavut is at the heart of this tug-of-war between economic development and environmental devastation. The Inuit, the people who call the Arctic home, are in the cross hairs of this battle and ostensibly have the power to determine how this drama over resource extraction will play out in an era when their traditional way of life is under unprecedented stress. Temperatures in the high north have been oscillating in extremes for the past several years with overall warmer winters and less ice. In 2012, the National Snow and Ice Data Centre registered that Arctic sea ice fell below 4 million square kilometres. This is the lowest level ever recorded and 50 per cent less area than when data collection began in 1979. Environmental divergence isn’t only affecting Nunavut’s frozen landscape; it is also threatening animals and their habitat. The most worrisome case is the caribou. Millions of these large herbivores once roamed the Arctic. Now, several caribou herds are in major decline causing alarm among Inuit, scientists, and conservationists. In 2013, Nunavut’s Environment Ministry released a comprehensive count of the South Baffin Island Caribou herd. The results are startling: caribou numbers have dropped by 95 per cent. The report cites climate change, disease and land use as possible threats. There have also been major losses to the Beverly and Ahiak populations totaling more than 50 per cent drop between 1994 and 2011. A lack of access to traditional hunting grounds coupled with declining caribou populations is devastating for Inuit communities. These consequences of climate change pose a threat to Inuit food security as the growing season is relatively short and Inuit rely heavily on game to supplement their diets. Another study conducted by the Natural Environmental Research Council in the UK found that at least 70% of melting Arctic sea ice is caused by human-induced climate change and not naturally occurring warmer temperatures as suggested by critics. Receding ice fields bring opportunity for economic development in Nunavut. According to Nunavut Tunngavik Inc.’s Inuit Owned Lands Information System (IOLIS), Nunavut’s land mass contains vast amounts of gold, diamonds, uranium, base metals and many other minerals difficult to find elsewhere in such abundance. Companies are deploying exploration mission to discover more deposits. Currently, the Meadowbank gold mine is the only extraction project in Nunavut. The site is operated by Agnico Eagle and is situated 70 kilometres north of Baker Lake. It has bolstered Nunavut’s growth rate to increase by 7.7% in 2011 making the territory Canada’s fastest growing economy. There are several other proposals in the consultation phase, including the Kiggavik uranium project. The site would include three open-pit mines, a processing mill and accommodation for employees. According to AREVA, the French multinational corporation forwarding the proposal, Kiggavik would create 2650 jobs in the surrounding area during the lifetime of the project and add more than $1 billion CAD to Nunavut and Canada’s economies through taxes and royalty fees. Nunavut Tunngavik Inc. represents Inuit interests in negotiations with mining corporations. The entity was created to implement the Nunavut Land Claims Agreement and administer land titles for Inuit in the territory. It is responsible for the Nunavut Impact Review Board- the regulatory body that reviews mining project proposals and determines which ventures are approved. “The Inuit organizations are organized as land [and] money holding corporations, which gives them an objective interest in profit. They seem very intent on pushing for mineral extraction,” says Ms. Smith*, a specialist in the political dynamics of resource development in Nunavut. This double-edged sword of environmental stress and the possibility of exponential riches has created tension as Inuit struggle to maintain their traditional way of life while attempting to improve socio-economic conditions. Despite its skyrocketing GDP and natural resource reserves, life for many in Nunavut is more difficult than in other parts of Canada. One of Nunavut’s biggest social issues is a high suicide rate. While suicide exists in all societies for a plethora of reasons, suicide rates among Inuit in Nunavut are stunning. According to Statistics Canada, young Inuit men are forty times more likely than white Canadian males to commit suicide. Overall, Inuit are ten times as likely to commit suicide as other Canadians and this number hasn’t budged in forty years. Jack Hicks, a doctoral candidate focusing on suicide prevention in Nunavut at the University of Greenland, is alarmed by these statistics. His research links this high suicide rate with childhood sexual and physical abuse. He is disappointed with the lack of implementation of overall health services in Nunavut and failure to implement the proposed provincial suicide prevention strategy. Last week, McGill University researchers released a psychological-autopsy study to pinpoint the causes of Inuit’s elevated suicide rates. Their findings indicate that high rates of childhood sexual and physical abuse as well as substance abuse among causes. An earlier study conducted of 1710 Inuit in 2008 found that 41% suffered severe sexual abuse and 31% were victims of severe physical abuse in childhood. Unemployment is another challenge. According to Statistics Canada, Nunavut has Canada’s highest unemployment rate of 13.5 percent compared with a national average of 7.1 per cent (May 2013). Many struggle to find gainful employment with most jobs available in administration, service and mining sectors. This problem is only going to become more acute in the future, as Nunavut is home to both Canada’s youngest and fastest growing population. Mining companies are peddling extraction proposals to Inuit organizations and communities as solutions to Nunavut’s socioeconomic difficulties. New projects promise job and business opportunities, economic growth, education and practical employment training and contributions to community life through donations while respecting the environment and employing Inuit Qaujimajatuqangit (IQ), Inuktitut for Inuit traditional knowledge. Despite its potential benefits, there remain clear challenges to extraction project employment opportunities in Nunavut. Often Inuit get stuck in manual labour or low-level administrative jobs while high-level positions are given to non-residents. Mining remains a male-dominated industry with women representing a fraction of the workforce. Moreover, most women fill unskilled positions with lower wages such as dishwashers or cleaning staff in camp dormitories due to the rotational nature of mining. There are also issues of gender discrimination and sexual harassment that dissuade women from working on extraction projects. Pauktuutit is currently researching the socioeconomic impacts of mining in Baker Lake, Nunavut, the current location of Meadowbank gold mine and the proposed site for the Kiggavik uranium mine. 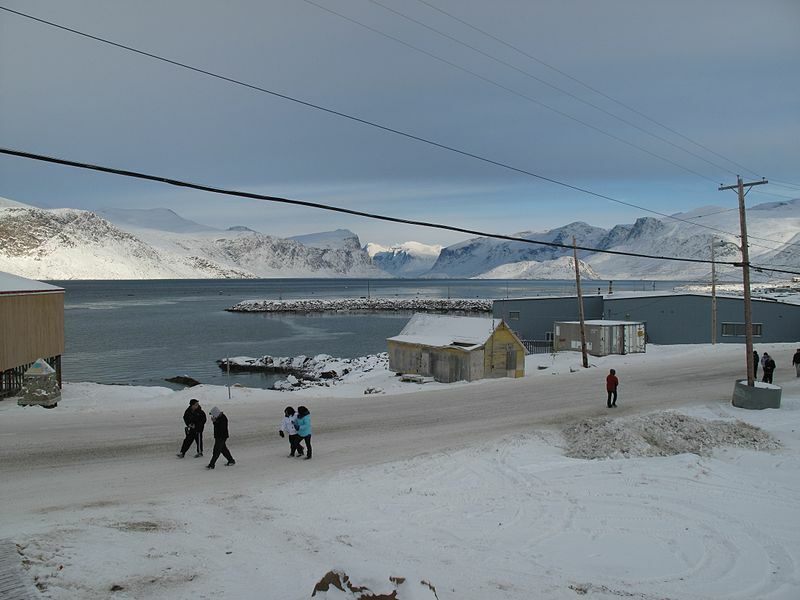 Preliminary results, provided by the organization, indicate that resource extraction can cause higher rates of crime, substance abuse, domestic violence, relationship stress and divorce, riskier sexual behaviour including increased prostitution among Inuit women as well as a loss of time devoted to traditional activities and even lower school attendance among children of miners. Evidently, employment in the extraction industry is not the magic potion to solve Nunavut’s socioeconomic issues. As the rush to harness Nunavut’s natural resources galvanizes, there is a growing tension between Inuit organizations and the communities they are supposed to represent. Inuit hold substantial power in the approval and regulation of mining projects on their territory because they own the mineral rights to most of Nunavut’s land. In theory, if a community opposed the development of a mine, it could be stopped. In reality, it has become clear that Inuit organizations are pursuing a development at all costs agenda despite community opposition in order to exploit the high revenue that mineral exploration brings. The Kiggavik uranium mine proposal in Baker Lake exemplifies this dictatorial approach. Although public consultations have been held, there had been no voting on the proposal and the process is plagued by bias. The consultants present at these community meetings, hired by Inuit organizations, were the exact same consultants contracted by AREVA to write the Kiggavik proposal’s Environmental Impact Statement. The lack of transparent democratic mechanisms to ensure community concerns are taken into consideration is disheartening. The opinions of people most impacted by the consequences of extraction development in Nunavut are effectively silenced, held hostage by the institutions intended to protect their interests. *Name has been changed by request.